Fun things to do in Las vegas? Are you looking for them? Among the unwritten laws of Sin City there are those to enter at least one casino and play at least a dollar, to admire the fountain show outside the Bellagio hotel, to take a picture in front of the iconic “Welcome to fabulous Las Vegas” and of course to get married by the awesome Elvis Presley. Yes, you got it right! To get married! A dream for many. In Las Vegas getting married (but also divorcing!) it is very easy and this is the perfect solution in case you do not want to spend too much doing so, if you are not the kind of person that likes long and boring ceremonies, in case your partner wants to do it but you are not ready and, of course, if you want the coolest celebrant ever. 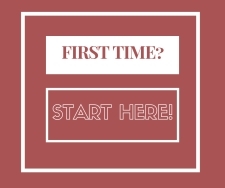 So, let’s start from the beginning! Are you in town or are you thinking about the fun things to do in Las Vegas once you are there? 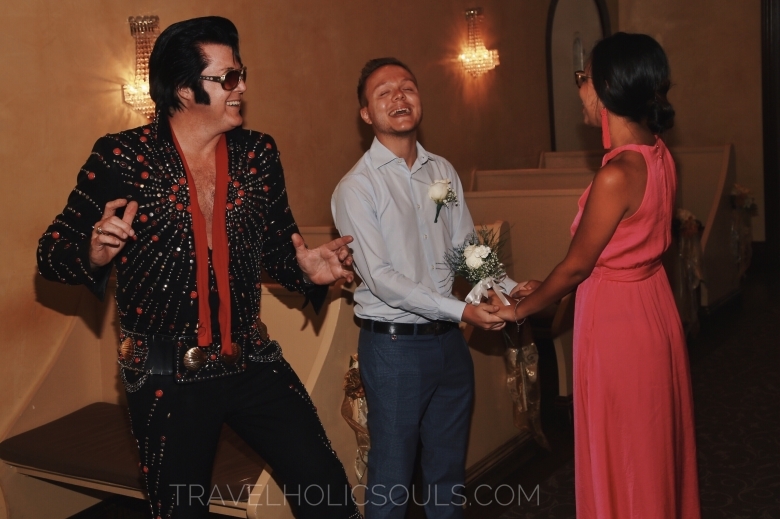 It will take only 5 minutes (we promise) to get married by Elvis and this crazy thing in Vegas is a must, one of those unforgettable experiences. 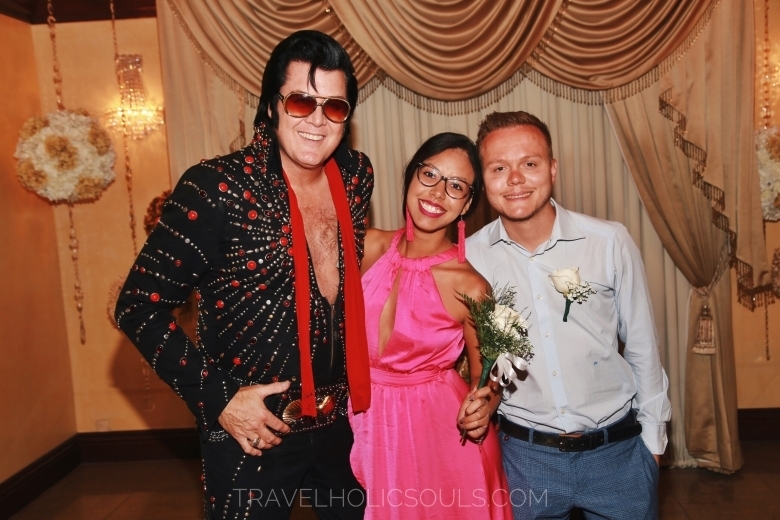 We have always dreamed of doing it and today, as – almost – husband and wife, we are ready to tell you how to do one of the best fun things to do in Las vegas. There are many rumors about getting married in the craziest city in the world: someone says it is a worthless farce and who ensures that it is valid in other parts of the world. Well, whatever the truth is, do you want to live this experience in the most serene way possible? Any chapel in fact will give you the opportunity to truly marry the one you love or to renew the vow that you have already done. For the first option, it will be necessary to request and wait for the approval of the marriage license at the Las Vegas municipal office. In the second case, you won’t need anything except all the will to get married happily and laugh at the most kitschy (and funniest) wedding you can imagine. 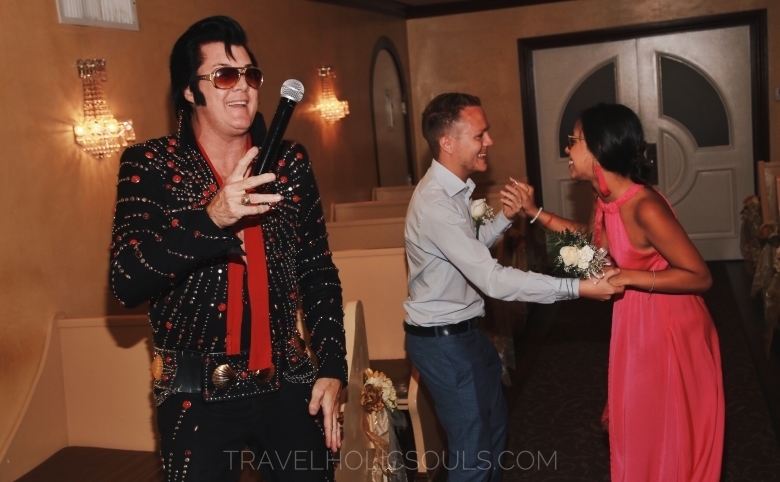 We have opted for the second option and the only document that certifies our wedding is the one signed by Elvis and his wife. Once you have chosen the option that best suits your needs, you will be ready for the one of the most fun things to do in Las Vegas. It all starts in the waiting room of a cute fake-churche (also because we do not believe there are actually churches with waiting rooms) in which your data will be verified (name and surname) and you will have to confirm the color of the bouquet – obviously it’s better to combine it with the flower on the chest of the groom, because you know, you can steal money, but you can’t steal class. -. When Elvis will finish declaring “husband and wife” someone ahead of you, it will be your turn. You will enter a room with a central nave and benches decorated with flowers and bows that can be used by your friends and relatives – in case they were with you -. 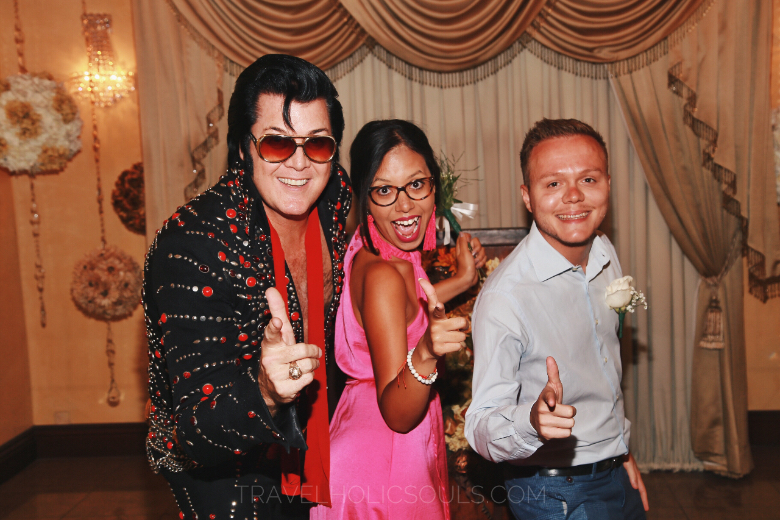 Elvis and the photographer will explain how to behave: the bride will be accompanied to the altar by international Presley and he will hold a fun ceremony in Las Vegas style. In case you had something to give (rings, bracelets or what you really want!) to seal your love in a symbolic way, there is the possibility of adding this part to the ceremony; otherwise it will be a kiss to seal your eternal love. Once finished, in the 24 hours after the ceremony the chapel will send via email photos and videos. Everything described is our first-hand experience. Wanna know how to live such an amazing experience exactly the way we did? Just kidding you’ll find all the details ahead. 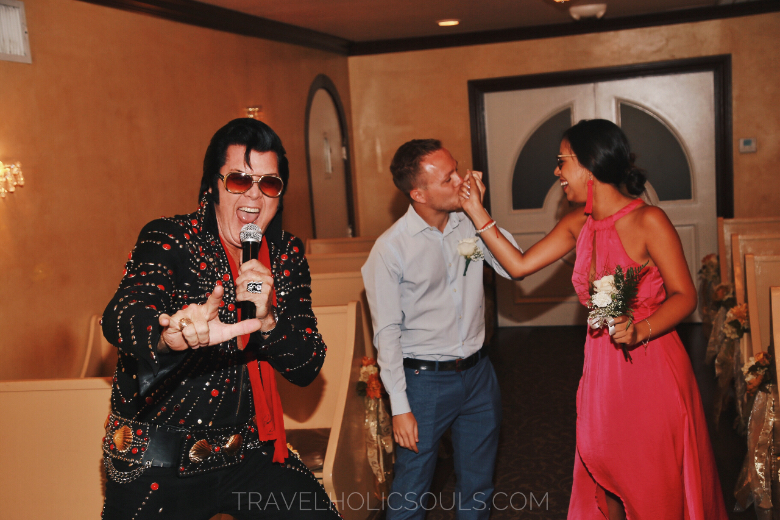 We’re talking about Las Vegas and getting married to Elvis … do not think you can go out and decide to do it on your own! Not just because marriage is not something that can be taken lightly. But mainly because there are so many people who want to do it. You will end up to go around the city chapel after chapel without finding any available spot. Although there are several chapels, open almost 24 hours a day, there are so many requests that it is not always easy to get married if you do not book early. One of the funniest and beautiful experience we ever had. It won’t last for long, but it’s definitely worth it. 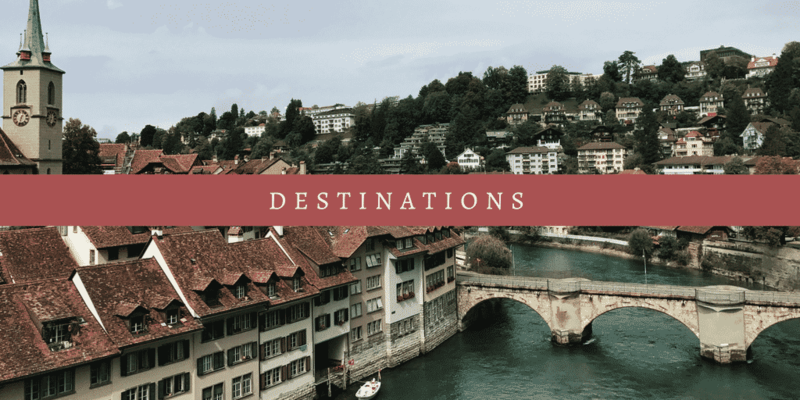 There are several packages that the chapel offers, obviously depending on the budget available, on the time of the day and what you want to do. Our package included a very nice driver (Ray, we love you!) and his white limousine – who came to pick us up at the hotel and brought back – a bouquet of flowers, a wedding video and 65 photographs. 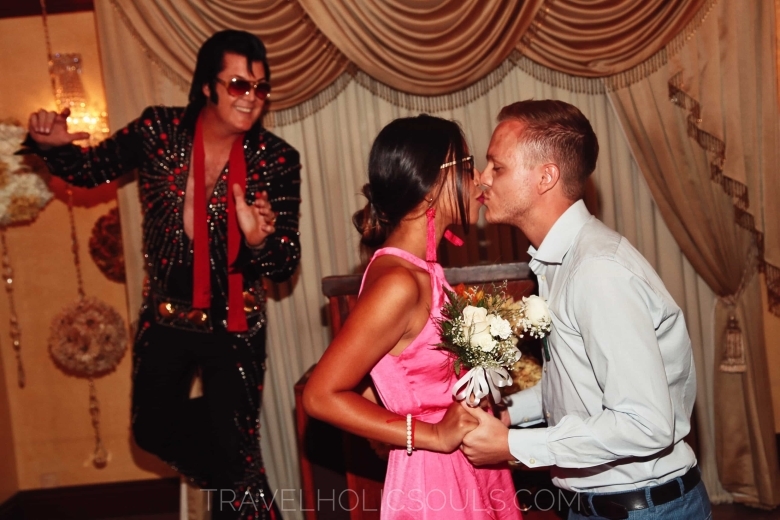 But if you want you can choose to get picked up by a pink Cadillac, that Elvis performs a concert of songs … until you can choose to get married over the Grand Canyon. Because, at the end, you get married only once in life. You have to do it with style, right? Ps. In the United States it is common practice to tip, so unless you want to look like the worst peasants, give at least $ 50 tip! If you asked us to do it again we would do it without second thought. Such a fun thing must necessarily be included in the list of the fun things to do in Las Vegas!!! Sin city is pure fun, you must have this list. When we think about that moment, we still laugh so badly! The situation, Elvis’ songs, to be honest we didn’t know all the words but who cares, we really had fun anyway, the unconventional promises … everything makes this activity magical. Then the context, the city, the darkness – because we recommend it, get married in the evening when the sun goes down and neon lights of all the hotels and casinos are lit – the sympathy of all the actors of this appearance … well, it will be unforgettable . You probably have to live it to understand what we’re talking about so go and get married, you will not regret it! Would you marry in Las Vegas or do you have anything else in mind about the fun things to do in Las Vegas and in the USA? 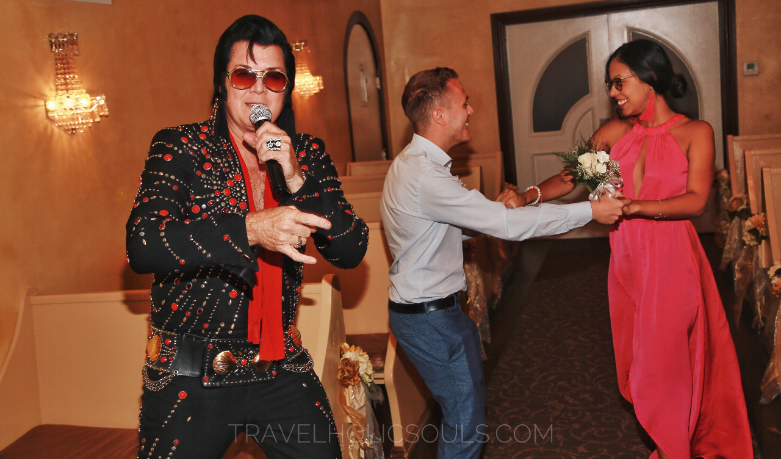 DISCLAIMER – THE WEDDING WAS GENTLY PROVIDED BY GRACELAND WEDDING CHAPEL. NEVERTHELESS, THE REVIEW AND OUR OPINIONS ARE ABSOLUTELY IMPARTIAL AND SINCERE.